Pregnancy incontinence is something that is often mentioned or heard about when talking about pregnancy, however many people don’t understand the real importance of the pelvic floor, and specifically why it is important to keep it strong during and after pregnancy. Many people are embarrassed when it comes to talking about ‘strengthening your pelvic floor’, however there really is nothing to be embarrassed about. In most cases, if you maintain a degree of strength before, during and after pregnancy, then there is no need for any more discussion about it. It is only when this is not done that you need to go through the slightly more embarrassing process of fixing it! At the end of the day, it really is only another group of muscles, just like your quads or calf muscles AND they have a very important function. 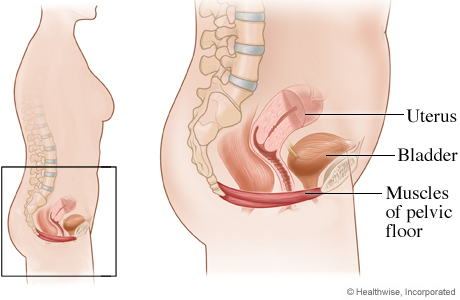 The pelvic floor muscles attach between the front pubic bone and your tail bone (forward and back) and from one sitting bone to the other (side to side) so that they form a sort of strong sling for your organs to rest on. It has holes for things like the urethra to pass through, and therefore this is how it is able to control excretion. Just like any other skeletal muscle, you are able to consciously feel and contract your pelvic floor, and this is how it is able to be strengthened and trained. What do they do and why are they so important? With all of these roles to play, especially when you add the weight of a baby on top of it, you can see why it is important to keep them strong. If not, you risk having light or severe incontinence, having a sore back during/after pregnancy and possible prolapse of organs. Of course, after birthing, they are going to be stretched and sore, but having the strength there to start with makes it that much easier to recover following. Plus, as they are stretched and sore, it makes it that much more important to work on strengthening them after birth. Especially as you can see so many things rely on them, for every day normal function. First you need to know which muscles to contract! The easiest position to be able to contract your pelvic floor is lying on your back with your knees in a bent position. Strengthening your pelvic floor is like strengthening any other muscle! You need to start off slowly, build up to more repetitions and keep going until you see results! You won’t cure leakage after one attempt but if you keep working on it you will start to notice the results and your strength increasing. It can take up to 6-12 weeks to see significant results, however some people can notice an improvement straightaway. Try to hold the squeeze for up to 10seconds, however to start with you may feel yourself loosing control after just a couple of seconds. When this happens you might feel other muscles such as abs, or buttocks trying to take over. Make sure you relax back to the start position as soon as you feel this happening. Rest for about 5 seconds and then repeat around 5-10 times. That is one set and that may be enough to begin with, however try to work towards doing three sets a day. Once you get the hang of it you can do it in any position, in any place, no one will even know! It can be helpful to make yourself a reminder to do them, or to associate them with another task eg when you’re brushing your teeth, doing the dishes or sitting at your office chair. What if I do suffer from incontinence following childbirth? It is a common thing to experience some degree of incontinence (from both sources unfortunately) following childbirth, and it is therefore nothing to be embarrassed about. All physiotherapists are trained in pelvic floor strengthening and are happy to help. It is better to get on to it sooner rather than later, just as it is with any other muscular injury. For severe cases, it is recommended to see a physiotherapist who specialises in woman’s health. Simply ask before you make an appointment if there is anyone available who specialises in woman’s health working at that clinic, or if they know of a clinic that does, you do not need to explain to the receptionist why you might need them! It may seem a daunting task but it really is so easy to get and keep your pelvic floor strong. Give it a go today, and if you do need a bit of help, give a physio a call. If they can’t help, they will put you on to some one who can!